Today’s blog is going to be a short one. I usually post my blog Monday morning but it is going up Monday evening instead because I had company over the weekend and I was drawing a blank on what to write. Then it occurred to me–It’s almost October! October is my favorite month. Autumn colors break forth and the world is filled with my favorite colors of orange and red. Vegetation starts to turn yellow and die. Trees become spooky representations of themselves. People start thinking of ghosts, witches, and jack o’ lanterns. Black candles go on sale everywhere. Wind scatters dead leaves around the tombstones of cemeteries. The veil thins as the Witches New Year approaches. We start thinking of the dead. Some have the custom of preparing the favorite meal of a dead relative and leaving an empty chair for the deceased relative to share in the feast. Rumor has it that Poltergeist is being remade. I didn’t like Spielberg’s version. It was too wholesome. I felt like I was watching E.T. I think it has good potential to be a really great supernatural movie if it is done right. So, how about you? What are your favorite scary movies? As we approach October’s full moon–otherwise known as the blood moon– I have been noticing my dreams are becoming very active. The Blood Moon, or Hunters Moon, is the first full moon after harvest or the autumn equinox. It gets its name from hunters who tracked and killed their prey by autumn moonlight, stockpiling food for the winter ahead. There is a greater significance to this moon if you are a witch/pagan. As we approach Samhain, otherwise known as Halloween, the veil between the worlds of the living and dead is at its thinnest. This is a very good time for divination, for contacting the dead, for sensing the shift in energy, and for paying attention to dreams. All last night I dreamed of falling. Initially, I was at a huge amusement park where people were jumping off a very high tower and screaming as they fell. At first I thought it was a ride, but then I realized they were just hitting the ground. I was appalled and couldn’t figure out why they were doing it. Next thing I know I am standing on the edge of the tower looking down. 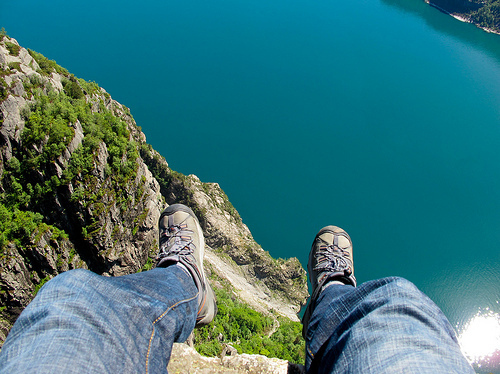 I am terrified of heights and there was nothing between me and the ledge. I slipped and fell only just managing to catch myself. Someone nearby helped pull me to safety. It doesn’t end there, however. I was on a narrow bridge walking along the edge. The great void pulled at me. Once again I fell over the edge, catching myself on some sort of plastic netting that hung from the bridge. I was barely hanging on, but no one could help me. Through much struggle I managed to slowly pull myself up and reach safety. 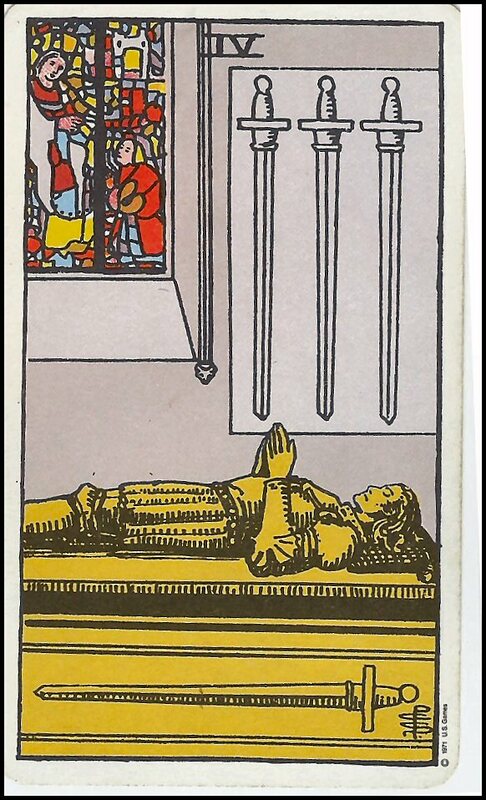 This basically coincides with the tarot cards I have been pulling recently. Like the II of Swords indicating my own denial that changes are coming in my life, whether I want to hide from them or not. (Hence the woman with the slipping blindfold and her back turned to the rocky shores.) 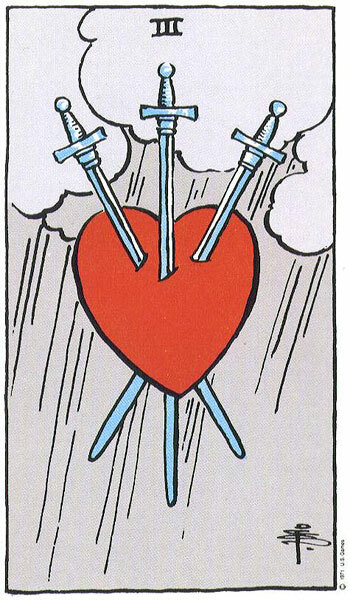 Also the III of Swords which depicts a heart pierced by three swords indicating painful awareness or betrayal. 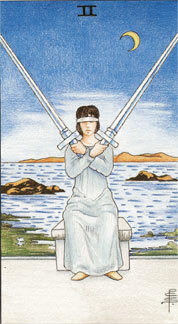 Finally, the IV of Swords representing a period of rest before one returns to a challenge they must cope with. I am getting the impression the universe is perceiving me as an ostrich with my head stuck in the ground. I am hoping for more time, which my massage therapist calls bargaining (at least I’ve moved on from denial). So what am I going to do about it? Nothing. I’m still bargaining. How about you? Have you had any interesting dreams this month? It is almost 3:30 AM on the morning of September 27, 2011. The new moon is less than two hours away. Why should I care? Because I have been studying Wiccan/Paganism for the last couple of months and the phases of the moon are very important. The last few days before new moon are considered ‘the dark of the moon.’ A dark time for witches. Some consider it a time for dark magic–if the need should arise. It is ruled over by Hecate(pro. 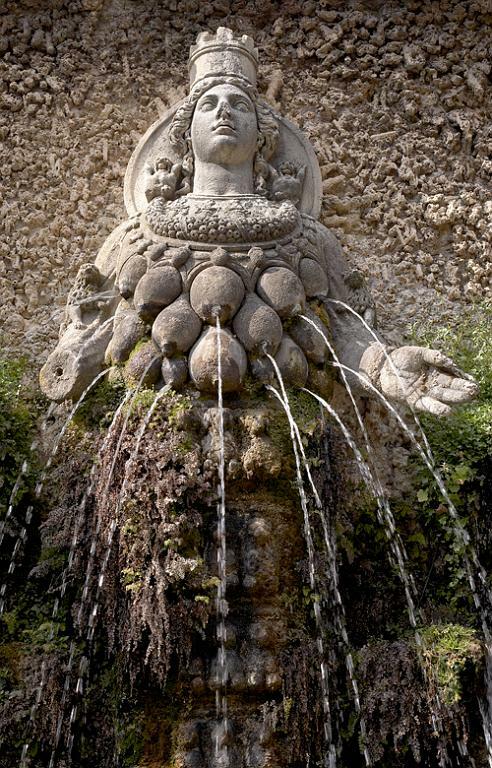 HE-katae), the crone goddess. If you wonder what she looks like, think about every Halloween witch or cartoon witch you’ve ever seen. She’s old, with a pointed hat, broom and cauldron. The pointed hat symbolizes the upward spiraling Cone of Power (which many witches seek to obtain during their circle rituals), the broomstick symbolizes a sweeping away of the old, and the cauldron symbolizes transformation. Why are these things important at this time of year? 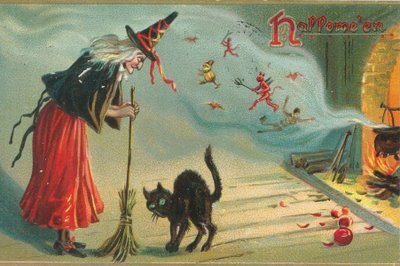 All Hallows Eve is the Pagan New Year–beginning after sundown on October 31st and continuing till sundown of November 1st. Samhain (pro. SOW-en), the Pagan holiday that coincides with Halloween, is Gaelic for ‘summer’s end.’ The harvest is complete, winter is beginning. Pagans at this time (much like modern people on December 31) reflected upon their physical mortality and the nature of change and transformation in the cycle of life and death. It is the most important time of year for a pagan and the most psychically charged. 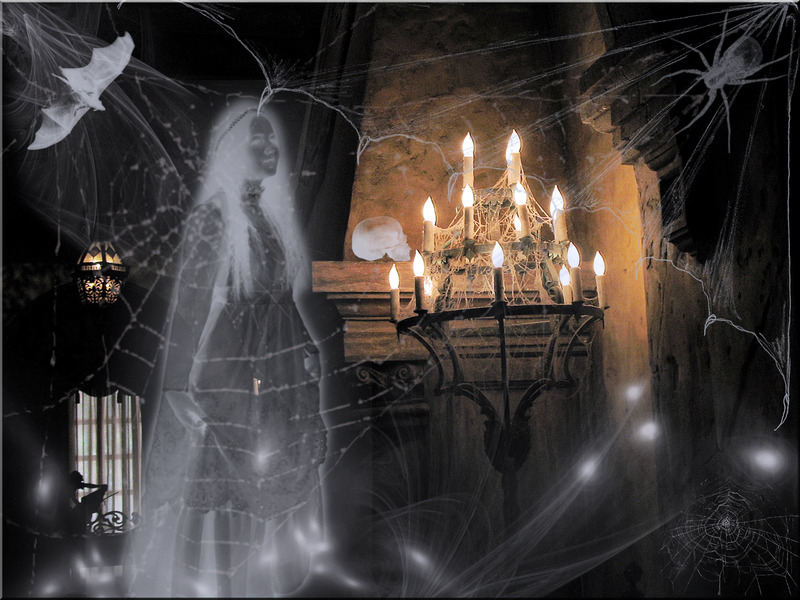 The veil between the living and the dead is believed to be thinnest at this time so the spirits of ancestors and loved ones can be honored. It’s not a time to worship Satan as witches don’t believe he exists. The pentacle they wear (whether right side up or upside down) symbolizes the 5 elements from which all things exist: earth, air, fire, water, and spirit. The upside down pentacle characterizes the second degree witch who must come to recognize her dark side during this time–much like Luke Skywalker. Back to the phases of the moon. Every phase has various characteristics that must be taken into account. New moon is used for personal growth, healing, or blessing a new project or venture. Full moon is used for banishing unwanted influences in life, protection and divination. The waning moon is for banishing/rejecting things in life we no longer want–like excess weight or negative habits/emotions (if hair is cut during this time it will take longer to grow out). Waxing moon is a time to attract things into our lives like prosperity, abundance, or magic. Since I am awake (I went to bed at 9pm last night only to awaken bright-eyed and bushy-tailed at 2am) I will likely go outside at 5:08am, light a black candle (to dispel negativity), and say an invocation to Hecate. Tonight I will likely hold a private ceremony and perform some candle magic in which I ask the Goddess for guidance in some aspect of my life. As previously mentioned, I have only been studying this for a couple of months, but as I read over it I realize how surreal it is considering I was a Jehovah’s Witness only a year ago. I am enjoying the freedom of this new belief system and the ability to practice it wherever, and whenever, I want. I also find it empowering after coming from a patriarchal dominated religion. What I am finding most interesting, however, are the pagan roots even among Jehovah’s Witnesses. This probably doesn’t sound like a big deal as all religions have adopted pagan customs and holidays. But JW’s held themselves above the rest. The reason they don’t celebrate holidays and birthdays (or anything really) is because of their apparent pagan roots. Customs and traditions are considered taboo by JW’s because of their often superstitious origins (i.e. throwing the bouquet at weddings or the traditional toasts). I didn’t even have a wedding cake at my wedding because I did some research and found its origins to be steeped in fertility (like everything else at weddings) and I didn’t want any part of childbirth. So for me to encounter, again and again, pagan influences within Jehovah’s Witnesses has been fascinating and enjoyable. October is a very auspicious time for JW’s. They feel this is the month when Jesus was enthroned as King in heaven in 1914. This is also supposed to be the month when Armageddon occurs. Is it an accident that this same month is the conclusion of the pagan year? I don’t think so. A supposedly popular ritual of Satanists is the passing of the bread and wine representing Jesus blood and body. Only, they do not partake. Their ritual involves the rejection of the Host, the holy sacrament, Jesus sacrifice. Jehovah’s Witnesses (ex or current) will know what I am getting at, but for those of you who are still in the dark–the most important day of the year for JW’s is the Lord’s Evening Meal in which the emblems representing Christs body and blood are passed. These emblems are passed, untouched, by 99% of the participants. Roughly 10,000 of the more than 7 million Jehovah’s Witnesses get to partake of the host. The rest practice a sort of subconscious rejection of the sacrifice since JW’s teach Jesus is the mediator for only those few who partake. Satanic ritual? Whether they are aware of it or not, it is. These are only a few of the parallels I have noticed since my studies began, but they only convince me all the more that, as Solomon said, “That which has come to be, that is what will come to be; and that which has been done, that is what will be done; and so there is nothing new under the sun.” (Ecc. 1:9) Religion comes as an answer to societies needs, bringing with them the roots of previous belief systems. Supposedly, the predominant features of Jesus birth, death, and life can be found in myths that existed long before his apparent birth (see: Horus). Warlike religions were created while society was in its adolescence and conquest and war were rampant. Peaceful religions (or religions who were supposed to be peaceful [Islam, Buddhism, and Christianity]) came about as man evolved from fighting to thinking. And apocalyptic religions (i.e. 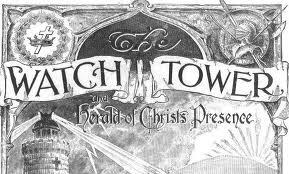 Adventists, Mormons, and Jehovah’s Witnesses) were born as a response to the increasingly secular world. But religion has failed to bring man deliverance and has only prevented scientific advancement. Society seems to be moving toward a more secular view which I applaud as the only way to evolve past the dark ages of religious intolerance. I hope for a time in which prejudice and judgment are replaced by peace and acceptance. This will only be possible when religion dies and spirituality takes over.